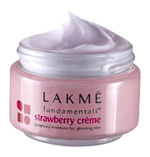 Lakme now brings you a whole new concept 'Lakme Fundamentals', a truly advanced and sophisticated range of skin care solutions. Aimed to make daily skin care an integral part of the Indian woman's beauty regime, this range has been especially innovated for Indian skin. 120ml (Worldwide) :$ 10.95 X Nos. Fruit Moisture Peach Milk Moisturiser with Nutritiv Moisture Technology-A breakthrough deep moisturizing technology that is a blend of 7 Hydrating Agents, 3 Essential Vitamins, 3 Anti Oxidants & 2 AHAs. Penetrates into the deepest and driest layers of your skin and moisturisers them. Skin feels revived and stays moisturized for 12 lonf hours. Use every day over cleansed skin for optimal results. Suitable for all skin types. Avoid contact with eyes. Wash your eyes thoroughly with clean water in case of eye contact 120ml (Worldwide) :$ 13.95 X Nos. Enriched with the goodness of Shea Butter, Lakme Winter Care Moisturiser has an active moisture replenishment system to relieve and revitalize dry skin. Maximises moisture retention for upto 12 hours. Revitalises dry skin in winter and makes skin feel soft and supple. 100ml (Worldwide) :$ 12.95 X Nos. A rich soft cream that pampers the skin with the luscious fragrance of fresh strawberries leaving it soft and delicately perfumed for hours. A combination of real strawberry extracts and active moisture balancer ensure the optimal level of moisture for your skin. It is fortified with UV filters to protect against skin damaging elements. Offers visibly soft, fragrant skin that glows with health.